Married to Jacqueline…has 1 son, AJ…has a red-and-black tattoo on his right forearm of his son...Signed by D-backs as a Minor League free agent (May 26, 2015). Batted .211 with 1 home run and 4 RBI in 14 games in his second Major League season with the D-backs...Hit his first Major League home run on Sept. 29 vs. Padres (off Jacob Nix)...Named a Pacific Coast League mid- and postseason All-Star and hit .311 with 31 doubles, 10 triples, 7 homers and 54 RBI in with Triple-A Reno...Ranked among PCL leaders in triples (T-3rd, 10), total bases (4th, 239) and runs scored (T-8th, 78)...Set a franchise record with 35-game hitting streak (June 24-Aug. 11), the fifth-longest, single-season hitting streak in PCL history and the longest since Joey Cora/Las Vegas in 1989 (37). Batted .308 in 12 games over 2 stints in his first Major League season with the D-backs...Hit .312 with 35 doubles, 4 triples, 10 homers and 65 RBI in 113 games for Reno, and was named a Pacific Coast League midseason All-Star...ranked among PCL leaders in doubles (1st), strikeout pct. (1st, 7.5), hits (4th) and runs (T-5th, 87)...Rated by Baseball America as the Best Defensive Second Baseman in the PCL. Combined to bat .305 (160-for-525) with 28 doubles, 6 home runs and 37 RBI in 133 games with Single-A Adv. Visalia, Double-A Mobile and Triple-A Reno…totaled 44 walks and 39 strikeouts...Played in 84 games at shortstop and 49 at second base...Was 13-of-14 in stolen base attempts...Named to the Southern League midseason All-Star Team. Hit .321 (108-for-336) with 18 doubles, 5 home runs and 39 RBI in 86 games with Single-A Kane County...Played in 64 games at shortstop and 21 at second base...Ranked among the Midwest League leaders in average (1st), on-base pct. (2nd, .385) and OPS (3rd, .823)...Released by St. Louis on March 28…played 30 games with Bridgeport in the independent Atlantic League before signing with Arizona as a free agent on May 26...Played with Lara in the Venezuelan Winter League and batted .335 (66-for-197) in 51 games. Batted .241 (104-for-431) with 17 doubles and 40 RBI in 112 games with Single-A Adv. Palm Beach…also played in 8 games with Double-A Springfield...Pitched on April 13 @ Charlotte (1 ER in 0.2 IP). Spent the season with Single-A Peoria and batted .248 (104- for-419) with 15 doubles, 1 homer and 39 RBI in 115 games...Appeared in 18 games with Caribes in the VWL. Combined to hit .314 (83-for-264) with 18 doubles, 4 home runs and 32 RBI in 69 games with Rookie Johnson City, Class Short-Season A Batavia and Palm Beach...Played in 19 games with Caribes in the VWL. Batted .289 (44-for-152) with 11 doubles 1 homer and 18 RBI in 43 games with Rookie Gulf Coast League Cardinals. Appeared in 34 games with GCL Cardinals and batted .239 (21- for-88) with 15 RBI. Spent his second straight season with the Venezuelan Summer League Cardinals and hit .264 (43-for-163) in 52 games. Played in 12 games in his fi rst pro season with VSL Cardinals. April 5, 2019 Arizona Diamondbacks recalled SS Ildemaro Vargas from Reno Aces. April 1, 2019 Arizona Diamondbacks optioned SS Ildemaro Vargas to Reno Aces. 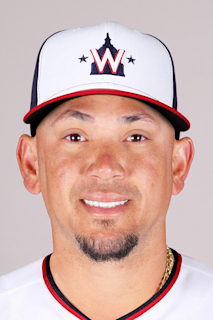 March 28, 2019 Arizona Diamondbacks recalled Ildemaro Vargas from Reno Aces. March 25, 2019 Arizona Diamondbacks optioned SS Ildemaro Vargas to Reno Aces. November 3, 2018 SS Ildemaro Vargas assigned to Cardenales de Lara. September 4, 2018 Arizona Diamondbacks recalled Ildemaro Vargas from Reno Aces. July 28, 2018 Arizona Diamondbacks optioned SS Ildemaro Vargas to Reno Aces. July 27, 2018 Arizona Diamondbacks recalled Ildemaro Vargas from Reno Aces. March 16, 2018 Arizona Diamondbacks optioned SS Ildemaro Vargas to Reno Aces. November 17, 2017 2B Ildemaro Vargas assigned to Cardenales de Lara. October 10, 2017 Ildemaro Vargas roster status changed by Arizona Diamondbacks. October 4, 2017 Arizona Diamondbacks reassigned 2B Ildemaro Vargas to the minor leagues. September 9, 2017 Arizona Diamondbacks recalled 2B Ildemaro Vargas from Reno Aces. August 7, 2017 Reno Aces activated 2B Ildemaro Vargas. August 4, 2017 Reno Aces sent 2B Ildemaro Vargas on a rehab assignment to AZL D-backs. August 4, 2017 sent 2B Ildemaro Vargas on a rehab assignment to AZL D-backs. July 24, 2017 Reno Aces placed 2B Ildemaro Vargas on the 7-day disabled list. July 3, 2017 Arizona Diamondbacks optioned 2B Ildemaro Vargas to Reno Aces. June 29, 2017 Arizona Diamondbacks recalled Ildemaro Vargas from Reno Aces. March 17, 2017 Arizona Diamondbacks optioned 2B Ildemaro Vargas to Reno Aces. November 18, 2016 Arizona Diamondbacks selected the contract of Ildemaro Vargas from Reno Aces. October 4, 2016 2B Ildemaro Vargas assigned to Cardenales de Lara. July 17, 2016 2B Ildemaro Vargas assigned to Reno Aces from Visalia Rawhide. July 16, 2016 3B Ildemaro Vargas assigned to Visalia Rawhide from Mobile BayBears. April 2, 2016 3B Ildemaro Vargas assigned to Mobile BayBears from Kane County Cougars. March 2, 2016 Arizona Diamondbacks invited non-roster 3B Ildemaro Vargas to spring training. January 2, 2016 3B Ildemaro Vargas assigned to Tigres de Aragua. December 31, 2015 3B Ildemaro Vargas transferred to Tigres de Aragua from Cardenales de Lara. September 27, 2015 3B Ildemaro Vargas assigned to Cardenales de Lara. May 27, 2015 3B Ildemaro Vargas assigned to Kane County Cougars. May 26, 2015 Arizona Diamondbacks signed free agent 3B Ildemaro Vargas to a minor league contract. March 30, 2015 Palm Beach Cardinals released 3B Ildemaro Vargas. January 12, 2015 3B Ildemaro Vargas assigned to Palm Beach Cardinals. January 8, 2015 St. Louis Cardinals signed free agent 3B Ildemaro Vargas to a minor league contract. August 23, 2014 3B Ildemaro Vargas assigned to Springfield Cardinals from Palm Beach Cardinals. April 1, 2014 3B Ildemaro Vargas assigned to Palm Beach Cardinals from Peoria Chiefs. October 9, 2013 SS Ildemaro Vargas assigned to Caribes de Anzoategui. May 4, 2013 Peoria Chiefs activated SS Ildemaro Vargas from the 7-day disabled list. March 31, 2013 2B Ildemaro Vargas assigned to Peoria Chiefs from State College Spikes. March 25, 2013 2B Ildemaro Vargas assigned to St. Louis Cardinals. October 10, 2012 2B Ildemaro Vargas assigned to Caribes de Anzoategui. September 2, 2012 2B Ildemaro Vargas assigned to Batavia Muckdogs from Johnson City Cardinals. June 15, 2012 Ildemaro Vargas assigned to Johnson City Cardinals from Palm Beach Cardinals. June 1, 2012 Ildemaro Vargas assigned to Palm Beach Cardinals from GCL Cardinals. October 4, 2010 2B Ildemaro Vargas assigned to Caribes de Anzoategui. December 31, 2009 2B Ildemaro Vargas elected free agency. June 24, 2008 St. Louis Cardinals signed free agent 2B Ildemaro Vargas to a minor league contract.